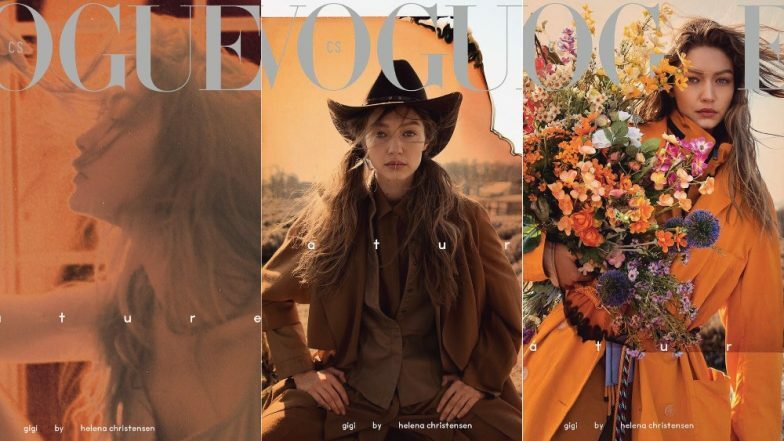 Gigi Hadid once again proves that she is the reigning queen of magazine covers. For the May issue of Vogue Czechoslovakia, the 23-year-old model posed for three of the covers. Needless to say, struck a gorgeous pose for all of them while channelling spring fashion. All the looks had a good connection to spring fashion as they had flowers, sepia hues and scenic background. For one of the covers, Gigi donned a sublime yellow Bottega Veneta trenchcoat. Layering up the look, she had a few scarves too that complimented the look. Rounding up the look, she held a garden of flowers on her left arm and looked too beautiful for words. In another cover picture, Gigi wore a slinky camisole with woollen hand gloves. The third cover had Gigi done a brown suit with a brown vest, pants, a tie and a baggy blazer. The look was completed with her tying her hair in two schoolgirl ponytails and a cowboy hat. While speaking about her way of dealing with the spotlight, Gigi told Harper's Bazaar magazine, "I always wanted success for myself. I wanted to support myself. I wanted to get to a place where I could have creative freedom and start to have more power to shape my life. Fame is something that I deal with and learn about every day." She further continued, "I think it’s tough. Obviously, people judge you. People can create a headline or an opinion about someone based on a small moment or a mistake. I’ve always been someone that feels heavily because I’m a projector." Adding how success and financial independence at a young age come with a price, she stated, "Becoming a successful and financially independent young woman so early on comes with responsibilities, which can take away from life’s innocence. But we have so much gratitude for the amazing journey Gigi is on."